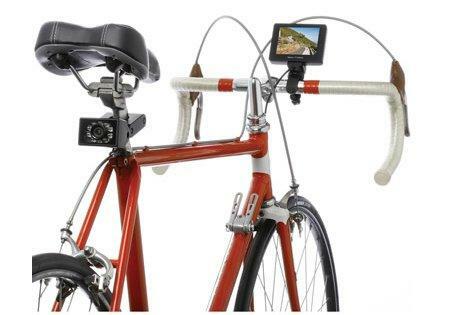 Bicycle Rearview Camera Seems Like It Could Come In Handy | OhGizmo! Why Make A Simple Light Switch When You Can Make A Complicated One? Life is already pretty miserable for cyclists everywhere. Latte sipping motorists in needlessly large cars are way too busy texting to pay any attention to anything on the road. So any piece of technology that makes a cyclists’ life easier is fine by us. The above Bicycle Rearview Camera sends a live feed of whatever is behind you so that you can keep focused on what’s in front and to the sides. The camera connects to the TFT screen via a 78 3/4″ zip-tied cable that accommodates any frame geometry and the battery in the monitor should last 10 hours on a 2 hour charge. There’s a quick-release mechanism so you don’t have to fiddle around when it’s time to take it in with you and a circular pattern of red LEDs flash when the camera’s built-in sensor detects low-light conditions for visibility to traffic. Finally, yes, it’s weatherproof so you can even take it out in the rain. Who’s d*mn business is it of yours, what size car ANYONE drives. gas, polluting the bla bla bla bla”, global warming bla bla bla. Bunch of tie-die dope smoking hippies! who are screwing up traffic trying to drive on MAJOR streets in America. “needlessly large cars” will be safer.